Water buildup around near-grade basement windows can cause infiltration through your window sill. Adding or replacing malfunctioning window wells can ensure that rainwater buildup in front of your window occurs well below the window sill and is drained faster than it can pool up. Vertical weeping tile and a gravel drainage bed will ensure that any water entering your window area will be drained, giving you peace of mind that your windows will be free from water infiltration. 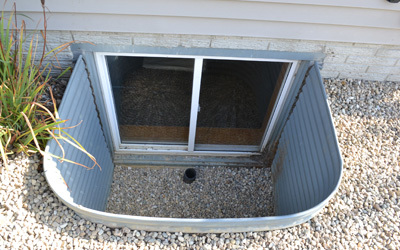 Custom window well covers are also available, protecting your window well from debris that can reduce drainage. When you hear the terms “damp-proofing” and “waterproofing” regarding your home’s basement and foundation, is there a difference? What do these terms mean? There are differences – and the differences are significant if you want to keep water out of your basement. Foundation damp-proofing is generally done during the construction phase to meet minimal building code standards. Damp-proofing makes use of a moisture-resistant material consisting of hot liquid asphalt and rubber coating with an insulating panel. The problem is that although damp-proofing is moisture resistant, it is not complete protection from water. Damp-proofing is only applied internally and water can still pass through the foundation externally. The internal system method is determined depending on these three reasons: One the area cannot be addressed from the exterior due to confined space or no access. The second, is the water problem is not a foundation leak but a hydrostatic pressure problem, which means the ground water under the concrete slab raises up and down and cause the water to penetrate through the basement slab or where the wall meets the floor. This ground water can also mean that there could be an underground creek where the house was build on. Because of this difference of land, this can justify a basement leak compared to you and your neighbor. The third is cost effectiveness for unfinished living areas. Mold can be a serious problem if it develops in your home. Mold will gradually destroy the area where it colonizes, and has the potential to create health problems for your home’s inhabitants. A foundation crack can occur for many reasons. Poor construction, soil condition/settlements, and act of god [earthquake/frost quake], any of these can cause stress on a foundation wall. Repairing a crack depends on the type of foundation wall and cause of crack. Cracks in foundation walls can be caused either by settlement of your home or poor construction practices, causing shrinkage in your concrete foundation wall. In either case, an inlet for water is created. This can cause serious damage and become larger over time due to freeze and thaw cycles allowing ice in this void. Foundation cracks can be fixed either from the inside using an epoxy injection method, or from the outside, digging down to the footing of the foundation, sealing water out using rubberized urethane. A drainage board is added to enhance the drainage process and move water away from the crack. Either repair method should be considered as quickly as possible to prevent further damage to your home. An interior weeping tile system, also referred to as an internal perimeter drain system, is the alternative to traditional foundation excavation and waterproofing for a concrete block foundation. 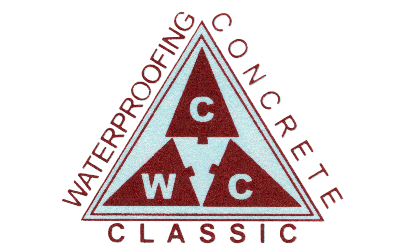 Compared to exterior waterproofing, an interior weeping tile system is much less expensive (since no excavation is involved) and is a proven, highly effective basement waterproofing method. Interior perimeter drainage systems are used mainly for waterproofing concrete block / cinder block foundation walls. This waterproofing system is so reliable that some very large companies sell this type of system for dealing with virtually all foundation waterproofing problems.